The Cross House has a whopping forty stained-glass windows. The conditions ranges from good, poor, to terrifying. Even the good windows will need to be taken apart to have all the lead caming replaced. Caming has a life-span of a century so the caming is already past its due date. I have a grant application out to restore all the stained-glass. However, I had one window restored so I could see how qualified the restoration people were. I was thrilled with the results. Last week I received a second completed window. This window was in such poor condition that I could not wait for the grant to be approved. I was worried (for good reason) that the next wind storm would cause the window to wholly collapse to the ground in a million bits. BEFORE. The whole left side of the window was held together, sorta, by clear tape. Note also the numerous MISSING pieces of glass! The window was so fragile that if one brushed against it the whole panel ominoulsy giggled! Terrifying! AFTER. Ta-da! It is not evident in the images, but is so in person, that all the clear glass is beveled. Nice. The colors look different in the two images. This reflects different lighting conditions. For example, the glass surrounding the center fleur-de-lys looks like it was replaced (based on the BEFORE image). But, it is the same glass. It is next-to-impossible to find PERFECT replacement glass for 120-year-old stained-glass windows. As such, the glass surrounding the smaller fleur-de-lis IS replacement glass, although the glass at the outer edge of these smaller fleur-de-lis is original. Oddly, the two sorta circles at the bottom center were replaced, although these were not damaged. I will have to find out why. The salvation of this window presents a preservation dilemma. You see, the glass field surrounding the three fleur-de-lis was originally all of one color/texture. Now it is not. The window, while still very beautiful, is now, well, busier than it was originally. The difference is that the AFTER is the result of trying to preserve as much of the original glass as possible, while also maintaining the symmetry of the design. However, by doing so the LOOK of the original has been altered (again, because perfect replacement glass is almost impossible to find). In the above image, note the three circles I have drawn around each fleur-de-lys. LEFT CIRCLE: The glass surrounding the fleur-de-lys is replacement glass. It might well be antique glass. This area was missing its original glass (see BEFORE image, top). CENTER CIRCLE: The glass surrounding the fleur-de-lys is original (although the color looks different than shown in the BEFORE image due to lighting conditions). RIGHT CIRCLE: The glass surrounding the fleur-de-lys is replacement glass. The original glass was intact. It was replaced by the restorer to maintain the symmetry of the design, thus matching the replacement glass around the left fleur-de-lys. However, I would rather that the original glass had remained, even though the symmetry of the design would have been affected. This way, the replacement glass to the left would have been self evident as a CHANGE. As it is now, it looks like the different glass surrounding the three fleur-de-lys was intentional. I have conflicting feelings about this. A part of me is dedicated to maniacally preserving original bits to the Cross House. Another part of me feels that the original look is more important than original bits. I am a little sad about this window because I preferred the look of the original, and the consistent background around the three fleur-de-lys. However, to have maintained the look would have resulted in an even greater loss of the original glass (as ALL of the glass surrounding the fleur-de-lis would have required replacing to replicate the original consistent background). This is only the second stained-glass window I have ever had restored. 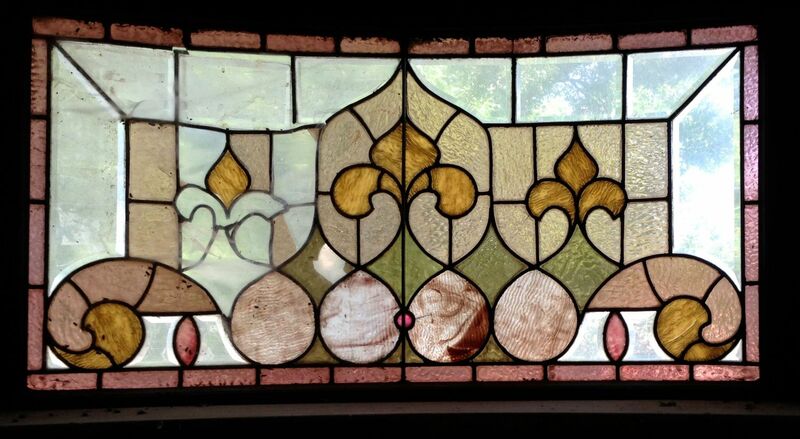 Before these two windows, I knew nothing about stained-glass restoration. I was delighted with the results of the first window (which had negligible loss of original glass). With this second window there has been a steep learning curve. I now know better how to direct the restoration of the remaining windows in the house, and will work closely with the restorer rather than the hands-off approach I used with the first two windows. I now also know that I will be OK with an obvious repair, rather than trying to hide repairs by changing the original look. 16 Responses to The Glory of the Glass. Part 2. A Conundrum. I agree the repaired window looks too busy and the classy simplicity is lost. Even though replacement glass may be hard to find, it seems they could find something closer than the two brown circles at the bottom. My vote would be for you to take some stained glass classes and learn to do it yourself. The worst that could happen is you have some ugly new came for the restorer to remove (vs the old worn down came). I have done some stained glass work in the past, it takes a bit of time, but is a real simple set up. It would definitely be worth looking into. The restorer did beautiful work. The quality is excellent. The issue is simply one of aesthetics versus preservation. To do it all over, I would have replaced more of the original glass so as to maintain the original design. The restorer was intent on preserving as much original glass, while still maintaining symmetry. Or, I might have ONLY replaced the missing glass, accepting that the new glass would not be a match. And the design would no longer be symmetrical. My eye would read this as REPAIR. In short, there is no perfect approach. Each approach has its points. And, I have zero time. My business is full time, and I squeeze in hours to paint the exterior of the Cross House, and refinish woodwork. I cannot take on any more!!!!!!! How many of these stained glass windows are the same size? Might you be able to cannibalize pieces from some of them to fix others? It might mean having a bunch taken out and boarded up at once but I don’t think that’s so bad. Cannibalize some of my stained-glass windows to restore others? The Cross House has 40 such windows. I plan to restore them all. They are one of the glories of the house. No I meant if you’re going to replace lots of pieces from some of them, can you match up all the necessary original pieces from one and then put the replacements in another. It seems to me that if you restore the original look with new material on one and keep original material on another but the two don’t exactly match each other anymore it’d be fine. I’d certainly never advocate destroying any of them! But seeing as how they’re all handmade, I guess it’s unlikely that an extra piece from one window would fit into another anyway. In the real world, I wouldn’t worry TOO much about a few of the windows having some pieces of glass that are an imperfect match, and for the long haul I’d try to preserve original material even if the look isn’t quite perfect. Passing time leaves its mark on old buildings after all. The above window is unique in the house. Most of the windows in the house are unique. Occasionally, two match, but only when they are side-by-side. Well, if you choose to restore the original look by replacing extra pieces in one, and that allows you to restore the other with original pieces, I’d say no one will notice that the two are slightly different. But again, I wouldn’t expect this to work. As for the ones that are ready to fall apart, there was some serious wind last night around here – I’d hurry up and pack them someplace safe! Although the restorer did a great job, I say he is not working hard enough. Between all the antique glass available AND all the new glass available AND AND the fact that your glass isn’t that complicated, he should have been able to easily come way closer than he did. AND if he wasn’t going to, he should have contacted you before going ahead. I do stained glass although not as a business but this guy I guess doesn’t want to do your other 38 windows. If he did, he would have been a lot more conscientious on the first two. In the restorer’s favor, he did get a good match on the green glass. I can’t tell that any of it was replaced. He did reasonably well with one of the missing yellow fleur-de-lys pieces, but the other is too faded. I’m kinda ambivalent about the background glass. Yes, it’s a mismatch with the center background and the outer borders, but it does look like he made an attempt to get close, and the replacement pieces match each other. It doesn’t strike me as horribly “wrong”. I think if I were you I’d be more unhappy about the two lower center roundels than anything else. It looks like he didn’t even try to match those to the outer two, and that mismatch is the most jarring to my eye. Especially since the color he chose kinda fights with the red jewel between them and makes it lose its brilliance. I hope he gave you the pieces he took out so you can have them replaced if you’re really unhappy with the result. I agree w/Montana Channing. I don’t think your glass ppl looked hard enuf. The range of glass available is myriad. I do believe that they could have found a hue MUCH more similar. Very little of the glass used looks that “rare” to me. I’ve done stained glass work. The hard part about restoration is trying to fit new glass into old came. If you replace all the came it’s fairly easy. You’re just making a new piece of glass w/the old parts + new came! I’d shop around a bit if you could. Explain your complaint. Clearly. And ask that you view the piece before they put it together and solder it. Just my 2 cents but I noticed the differences immediately……that would irk me. This post was published two years ago. 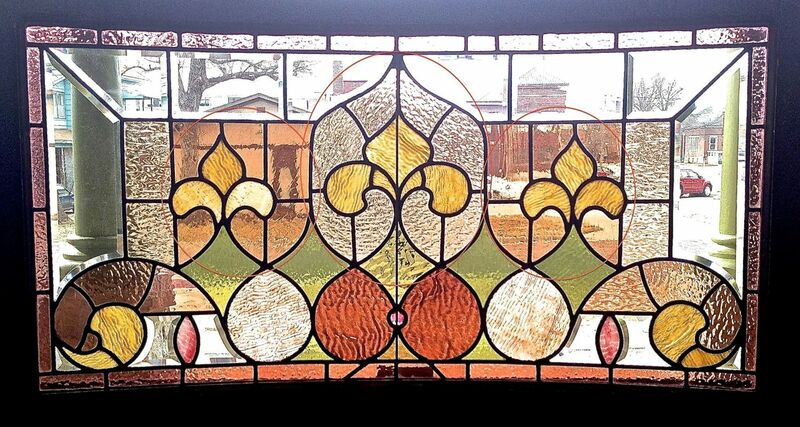 Since then I have continued working with the same stained-glass company and have been very pleased. During this period I have made clear that as much of the original glass as possible should be retained. If a piece is cracked, I would rather it be glued than replaced (or a piece of caming inserted). If you see later posts on the stained-glass windows in the Cross House (there are many posts for there are many windows!) I suspect that you will agree that subsequent windows are gloriously restored. SO glad to hear it! Sadly I’m “late to the party” here and still catching up! The left fleur is surrounded by wavy glass, but the right one is surrounded by ‘clear’ glass. That’s the thing troubling me.